Basic protection with the added benefit of power-saving outlets that automatically cut power to idle equipment. Fail-safe mode disconnects equipment from power supply once the unit has been compromised, ensuring no damaging surges get through after an initial surge event. Special components provide catastrophic event protection, ensuring instantaneous reaction to lightning strikes and wiring faults. Building wiring fault LED indicator informs users of potentially dangerous wiring problems in a wall circuit. 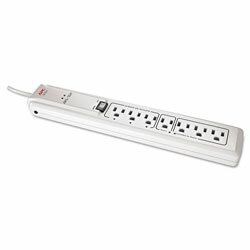 White Surge Protectors from APC! 108 In Stock today.